I hope your all well, happy and healthy. 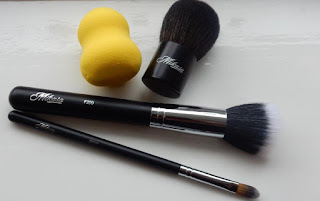 I have tried this wonderful brushes above from a company called Mikasa Beauty. They are a new company and we found each other over on Instagram, one of the reasons I love Insta so much. Always come across recent start ups with marvelous products, that I may have missed if I wasn't on there. So Mikasa sent me the above set to review. The packaging is opulent and gives an apt impression of luxury. Once I opened the boxes I wasn't disappointed, the brushes are well made. The handles are made of wood, they are really smooth and quite durable. The brush bristles are super soft, Mikasa uses the finest grade of goat hair for their brushes and honestly you can tell when using it is like silk against my skin. They also have synthetic brushes for eye makeup. They use copper for the ferrules, which finishes off this stylish brush. I am very impressed by the packaging and level of quality of these brushes. So I hear you say yes they look wow, but do they work? Honestly they are on par with my Mac brushes and I so want to add more of these brushes to my never ending collection. The lemon drop blender is so cute, my 5 year old daughter keeps running off with it. It is great to get into the nooks and crannies of the face with this blender. Love these! Will place an order! Thanks for the 15 percent off code. Love these brushes! Great review Shanel! Thanks so much for this fantastic review Shanel! We greatly appreciate your work! I'm sorry about your mom, losing someone close is difficult and then to see how some people behave. It is good you found out sooner than later. Thank you for your condolences, it is at times like these you know the real from the fake. After saying goodbye to mummy I can say good bye to anyone. On par with MAC 👀 Tempting! The fact that these brushes are on par with MAC in quality makes me want to check them out. Thanks for the intro! Makeup brushes are THE BEST THING EVER!!!! I have quite a few and I just love them! 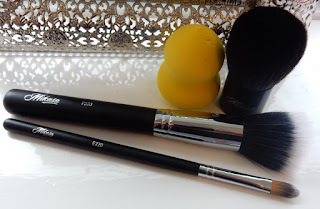 These look really nice - I love makeup brushes and keep adding more to the collection, love them! Good to know this brand! Nice review! These are really good . I need these too .